Kenn Hoekstra: Thundarr The Barbarian Released On DVD! Thundarr The Barbarian Released On DVD! As some of you are probably aware, I own a little corner of the web dedicated to the old NBC Television cartoon series Thundarr The Barbarian. For about 10 years now, I've been petitioning Warner Bros. and Cartoon Network to release the series on DVD. That day, it seems, has arrived! 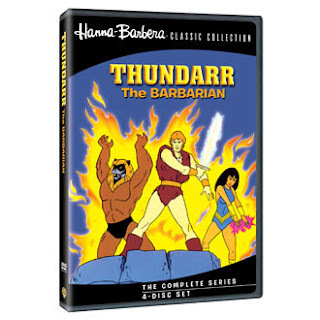 Check it out: Thundarr The Barbarian on DVD : The Official Release From Warner Bros.
Just in time for my birthday! I personally thing WB should send me a copy for all of my Thundarr promotion over the years, but hey, who am I to complain? I'm just excited it's finally out! Go snag a copy for your kids (who am I kidding, you want this bad boy for yourself!) today! IT Professional. Packers, Brewers, Bucks and Badgers Fan! Aspiring Screenwriter who loves Movies, Sci-Fi, Horror, Humor, Playing Chess - University of Wisconsin - Whitewater graduate. Opinions are my own. Twitter Contest - NBA Themed Novels!